Cardiac MRI offers physicians comprehensive data related to cardiovascular function and disease. Because it’s noninvasive and doesn’t expose patients to ionizing radiation, it entails less risk than more widely applied diagnostic procedures. Further, cardiac MRI fosters rapid analysis and increased accuracy. In certain patient subsets, the modality offers a favorable alternative to competing modalities such as stress tests, electrocardiography, cardiac CT, and SPECT imaging. However, despite the modality’s potential advantages and the growing body of recent research that underscores its value and greater potential, its application has been hampered by practical considerations such as cost and training, as well as perceptions about how it fits into the overall scheme of cardiac imaging. A flexible tool, cardiac MRI has been deployed for a variety of specific purposes, such as the detection and management of congenital heart disease and cardiac masses, the assessment of valvular and ventricular function, myocardial perfusion, and the development of patient treatment protocols. Presently, most cardiac MRI exams are accomplished on 1.5T systems. But facilities with the economic, technical, and staff resources are looking toward 3T systems. “The main advantages of 3T MRI scanners are most evident in the areas of myocardial perfusion and delayed enhancement imaging,” says Ricardo C. Cury, MD, medical director of cardiac MRI and CT at the Baptist Cardiac and Vascular Institute in Miami. “Cardiac MRI also adds value in the areas of viability and coronary MRA [MR angiography],” adds Scott D. Flamm, MD, who heads the cardiovascular imaging division at the Cleveland Clinic’s Imaging Institute in Ohio, a site that routinely deploys cardiac MRI for patient care. Meanwhile, applications with the mainstay 1.5T systems have been well established and bolstered by systemic advancements that include more sophisticated coil design (ie, up to 32 coil elements for cardiac imaging) that provides clinicians increased capabilities in parallel acquisition techniques, as well as a positive trade-off between signal-to-noise ratio spatial resolution and image acquisition, says Cury, who is also a consulting radiologist at Massachusetts General Hospital and an assistant professor of radiology at Harvard Medical School. In addition, the Cleveland Clinic deploys cardiac MRI extensively for infiltrative cardiomyopathy, particularly hypertrophic cardiomyopathy. “We also use it for pericardial disease, constrictive pericarditis, cardiac masses, thoracic aortic disease, pulmonary vein assessment, and arteritis,” says Flamm. “It has been cast in the designated problem-solver role in the realm of cardiac imaging,” adds Roth. But Cury believes that cardiac MRI can and should be positioned closer to the front end of the diagnostic process—a placement that would, in turn, heighten the level of cardiac patient care. “What I’d like to see happen is that cardiac MRI moves into the forefront of cardiac imaging so that it isn’t the last resource for difficult cases,” he says. Further, he has ventured into a venue where this can happen, at least for a specific patient populations. Cury and his colleagues at Massachusetts General Hospital and Harvard Medical School recently conducted a study that demonstrated the viability of cardiac MRI as a noninvasive test option that could accurately assess patients who presented in the emergency department with acute chest pain. 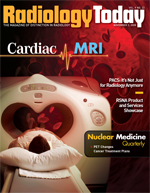 Their results, published in the August 19 issue of Circulation, suggest that cardiac MRI could be more effective for triaging chest pain patients compared with traditional risk-assessment techniques. Among current clinical methods are detailed assessments based on electrocardiograms (ECGs) and cardiac enzyme measurements. But these aren’t always effective techniques, as their results may compel physicians to admit patients who really don’t require hospitalization. Specifically, the study shows that cardiac MRI, combined with T2-weighted imaging and left ventricular wall thickness analysis, provided a high level of diagnostic accuracy in detecting patients with acute coronary syndrome (ACS) and excluding those without. The study included 62 patients who came into the emergency setting with acute chest pain, as well as negative cardiac biomarkers, and without ECG changes that would indicate acute ischemia. All subjects were imaged on a 1.5T scanning system equipped with an eighth-element, phased-array cardiac coil. Following contrast injections, the patients were scanned within the parameters of a specially developed protocol, which consisted of four steps. “Those steps included T2-weighted imaging, first-pass perfusion, delayed enhancement MRI to look for areas of myocardial necrosis, and cine wall motion, which evaluates left ventricular function,” explains Cury. Employing this new protocol, the researchers were able to accomplish 30-minute workups that exhibited accuracy levels quite high for detection of patients with ACS. Also, the addition of the T2-weighted MRI sequence enabled physicians to see edema in the myocardium, a primary sign of acute injury to the heart. Further, the protocol allowed them to differentiate between patients with acute vs. old myocardial infarction (MI). This differentiation helps physicians increase predictive capabilities when determining which patients are at high risk for ACS and which ones could be sent home—an important consideration, since many patients entering an emergency department who complain of severe chest pain face the risk of ACS despite the fact that initial biomarkers (cardiac enzymes), cardiac injury, and ECG changes may not indicate that a serious problem exists. In the large picture, study percentages were positive. “Overall, diagnostic accuracy was 93%, while sensitivity was 85% and specificity exceeded 90%,” says Cury. Still, despite ongoing cardiac MRI development, the modality hasn’t experienced widespread application. “It’s one thing to do a study that demonstrates significant findings, but deploying the technology on a routine basis is another issue,” says Flamm. “It’s just not that simple. In general, MRI is always more complicated than the alternatives, he says, and that is especially the case with cardiac MRI due to substantial hurdles that include cardiac pulsation and breathing motion artifacts, among other issues that slow down the developmental curve, as far as usage. Moreover, available alternatives can effectively accomplish what users require. “Other modalities have proven to be quite accurate, and they can provide the kind of information needed in the clinical circumstances where they’re applied,” says Roth.